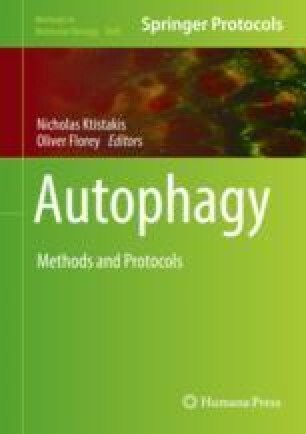 Autophagy-related organelles, including omegasomes, isolation membranes (or phagophores), autophagosomes, and autolysosomes, are characterized by dynamic changes in lipid membranes including morphology as well as their associated proteins. Therefore, it is critical to define and track membranous elements for identification and detailed morphological analyses of these organelles. However, it is often difficult to clearly observe these organelles with good morphology in conventional electron microscopy (EM), thus hampering 3D analyses and correlative light-electron microscopy (CLEM). Here, we focus on describing fixation procedures using (1) ferrocyanide-reduced osmium for CLEM and (2) aldehyde/OsO4 mixture for detecting omegasome structures and isolation membrane-associated tubules (IMATs). These methods can be easily applied to cultured mammalian cells for conventional and cutting-edge EM analyses, leading to a better understanding of ultrastructural details in autophagosome formation. We thank all the members in our department for helpful discussions. This work was supported by JSPS KAKENHI Grant numbers 24390048 and 15H04670 (to S. Waguri).